After landing in Innsbruck, Ellison and friends kicked off their journey in true Tyrolean fashion, dining at a new-yet-old-school restaurant complete with waitresses in dirndls. Did Ellison don a Bavarian hat for the occasion? Most likely. Afterwards it was only a quick 45-minute drive to idyllic Schloss Elmau, one of Ellison’s favorite retreats. On this visit, she experienced some fun, different activities, like traveling over the river and through the woods by horse and sleigh to picturesque Mittenwald. The only downside (or, rather downslide) of the long weekend was a minor sledding accident, but she managed to rally, buoying her spirits and dulling the pain with friends and glühwein. Then it was onwards and upwards to Norway, a first-time visit for Ellison who already says she can’t wait to return. They traveled to the farthest north, to Wolf Lodge, a unique eco-conscious luxury lodge near the town of Narvik. It sits in Polar Park, deep inside the Arctic Circle, and is home to a large selection of Arctic animals including wolverine, Arctic fox, bears, lynx, reindeer and, yes, the star of the show (and snow)—the wolf. Wolf Lodge is situated right within the wolf enclosure and was designed to have unobstructed views of these remarkable animals in their natural habitat. The group entered the lodge via a tunnel so as not to disturb the animals. There, in surroundings both Scandinavian spartan and snug, they relaxed in comfort while observing reindeer amble by the floor-to-ceiling windows. The best, however, was yet to come. The next day, they got up to experience an up-close-and-personal encounter with the wolves themselves! The keepers instructed them to kneel upon entering the enclosure and avoid making direct eye contact (as both could be construed as a dominance challenge). Unable to take a knee (due to said leg injury), Ellison sat with friend Emily Parke and let the wolves approach. The alpha female and alpha male were the first to arrive, along with another member of the pack, and after some exploratory sniffing, they showered Ellison and Emily with the famous “wolf kisses.” “Transcendent,” says Ellison of the experience. “There’s really nothing else like it in the world.” More wonders awaited that night when, ticking off another item on the bucket list, Ellison et al. received a full show of the elusive aurora borealis. “Totally spectacular,” says Ellison. “It’s a tired phrase, but it really is a once-in-a-lifetime kind of thing.” The lodge is perfectly positioned for viewing the Northern Lights from late August until mid-April so your chances of seeing them are relatively high. Bracing themselves against the Arctic chill, they marveled at the night sky, around a bonfire and with a sense of bonhomie. And as if Mother Nature’s spectacular showing wasn’t enough, there was a surprise towards the evening’s end, and what a surprise it was! Not only were they treated to the dancing lights, but they also spotted a possible UFO—and this wasn’t just the glühwein talking. The next day reports in the media confirmed sightings of an unidentified flying object streaking across the northern sky and then appearing to break apart. Wolves, the Aurora Borealis, a UFO—needless to say, it was one for the books. Leaving the frigid north, they headed south to lovely, secluded Villa Amot, a country estate in the heart of the fjord region. 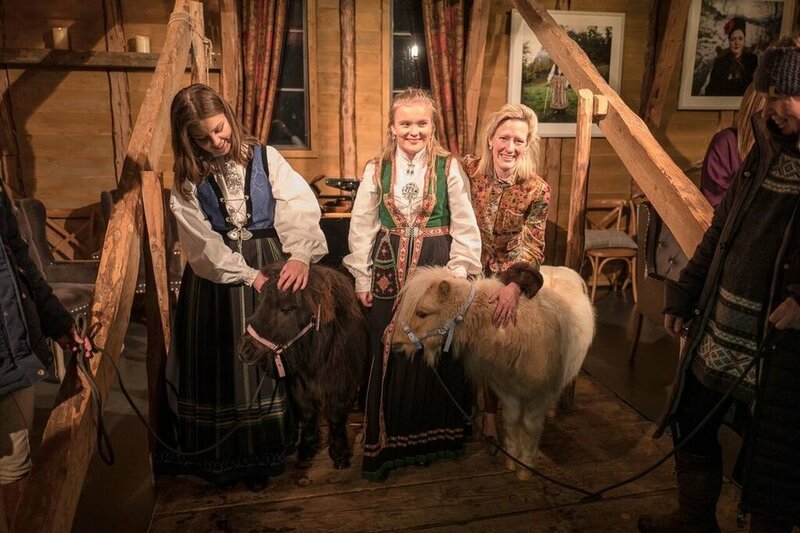 There they had a birthday celebration for one of their party’s members that included a private concert in the barn/concert hall with professional musicians; at some point, wee, smiling Norwegian horses—tiny of hoof large of tooth—were trotted out to frolic about the concert hall. Ellison et al. loved the small, friendly staff and proprietors who orchestrated this whole event and attended to their every need. Case in point—when Ellison’s sledding injury put a cramp in her style and a limp in her step, the Chef—who also happened to be a farmer and doctor—came to the rescue and set her aright. “He had hands the size of Thor,” Ellison wistfully recalls. One outing involved a gondola ride to Gap Prevent, a swell hospital/clinic/boutique hotel where one can check in for a full body/mind/and spirit checkup. Here various medical specialists offer a preventative, holistic approach to health. On another adventure, they took an exhilarating helicopter ride above the fjords and landed on a little island with only 100 inhabitants. There, in a serendipitous turn, they crossed paths with a Norwegian journalist who interviewed them for a radio show about tourism. Let us plan a trip to Norway for you—Norway your way!